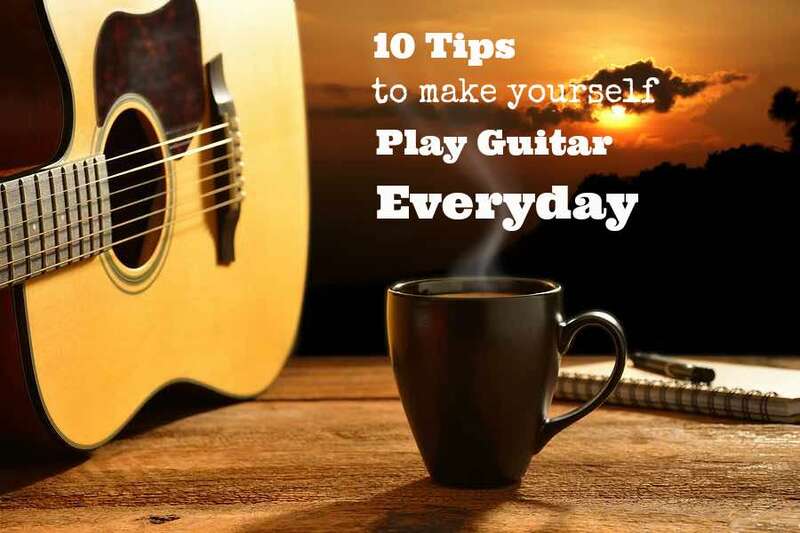 Most of us would like to play guitar everyday, but the reality is there are so many other things on our todo list we sometimes forget to practice at all. So I tried a little experiment a few weeks ago. I took a piece of a paper and wrote down the most important scales, songs and exercises I needed to work on. I placed the notes on the fridge, the toilet and living room walls. It now keeps reminding me of what I need to be practicing even when I’m too busy and get lost in other things. The fact that I’m constantly reminded, triggers me to pick up my guitar several times a day and just play. That’s what I need. Along with this effective trick I use some other strategies to make sure there’s nothing in my way. Read and apply them. And remember The more you practice, the better you get, the more fun it will be! Place reminders everywhere. Put reminders in your cell phone and your computer calender. Place reminders on the kitchen fridge and the toilet wall. Wherever you spend most of your time you want to put up a reminder that makes you start practicing. Eliminate every obstacle that delays the immediate action of guitar practice. Make sure your guitar and equipment is already set up, so you can plug in and go. You can also practice on an acoustic. The simpler, the better. Turn off any electronic devices like internet, cell phones, computers, TV and radio. If there is a lot going on outside of your window that will distract you then close your curtains. You want to focus on becoming a better guitar player. Get rid of any distractions! Play things you really want to play. If you’re motivated it is much easier to start playing. Find two of your favorite songs, scales and exercises to practice on. Write them down so you’ll will think about the good stuff before you’re going to play. Also print out your favorite songs, scales and exercise and place them on the toilet wall or somewhere in your living room. Out of sight is out of mind, In sight is in your mind. If you need to practice some exercises that are somewhat difficult and less motivating, think about the goal. What’s in it for you on the long term? Where will it take you? Find something that makes the exercises fun and exciting. Make yourself a nice hot cappuccino. Just practice and focus on your playing without expecting too much from yourself. With every practice session you will improve even if it doesn’t seem like it. Sometimes your practice is the pre-work for the next practice session. Know that every guitar workout takes you to the next step. Light up and enjoy it no matter what. Wake up 15 minutes or 30 minutes earlier. You can play soft so you won’t wake up any neighbors. You’re playing guitar for practicing purposes you don’t need to play for big audience. Soft is okay. Everything is allowed if it makes your start practicing. Watch less TV and play guitar instead or play guitar while watching TV. Create a private, cosy and inspiring space in the house with plenty of natural light. A space where you can practice without distraction. Where you can just plug in and go. A space where it’s quiet and where you won’t be interrupted. A space where you want to be everyday to play guitar. Observe your thoughts and emotions. Let go of urges to check email, Facebook or Twitter. Let go of urges to organize stuff. These are just your thoughts running around in your head trying to keep you busy every second of the day. Your mind wants you to do easier things first. Don’t listen to it. Whenever you want to play guitar it says: “Okay but first let’s check if you got any messages and then play guitar” And you know what? Once you’re checking things online you are lost in the space of internet and forgot about playing guitar. Let go of these urges and start playing guitar first. Check email, social media later and other things later. The world won’t end if you play guitar first, it will only get better. Find yourself a guitar teacher or start playing in a band. This forces you to practice because the band or the teacher will make you accountable. These are great ways to keep playing everyday. Do you know any good tips to start playing everyday? I do a plan with 3 objectives that I want to proactive. I put time on each one. Example: fingerpicking, blues licks & songs. I want to practice each one 30 minutes. I dividende time in 3, so 10 minutes by practice. The fact that is a short part of time, it encourage me to give time because it is short. It is weird but I feel less guilty to let down the things to do in the house. So I practice all the I’ve written down on my sheet and sometimes I put more minutes for one or two points because I know that I can reach my objectives. So forgive my poor English. That’s a great approach. That kind of practice workout works good too. A simpler hint: Touch your guitar at least once each day. It’s amazing how this simple shift in attention will lead you to more practice. Absolutely right that electronic “gizmos” (computers, phones, tablets, video games) are a terrible distraction. As a “first steps” beginner I’d add amps to that list – with modern amps having so many modes there’s a temptation to find that “perfect settting”. Be strong – chose a setting in the first five minutes of practice and stick with it! What I’ve found helpful when I’ve lost my practice mojo is to mix it up. If you usually play with a pick then go fingerstyle or hybrid. Pick a piece you like and play a different technique – maybe throw some hammer-on/pull-off into the mix? And if that fails too then maybe just do some “noddling” with scales – it’s amazing how you find find a note combo that sounds “right”. End of the day, it’s helping train your fingers! Anyone got any music recommendations for a complete beginner? (TAB please, I don’t read music yet). I agree. One or two settings and get on with playing guitar. Avoid getting lost in the world of sounds, instead get lost in the world of playing. Keep your guitar on a stand and readily available. I have three guitars. The acoustic is in my living room, a Les Paul is in the family room hooked up to a small practice amp, and my strat is plugged into my Peavey Vypyr amp in my music room/office. It’s better to pick the guitar up for multiple short periods than to try to play one extended practice session. And, as was said before, if you don’t seem to be making progress, don’t worry about it. Keep practicing. You are moving forward a tiny bit each time you practice and, the more practicing you do, the sooner you will get where you want to be. But I have a sad note here at the end… you will never get there. When you achieve your initial goals, you will find that your goals have changed. It is a lifelong commitment. And that’s a good thing. Thank you for this, and all of the articles you write. I have been reading for a couple of years, and have really benefited from guitarhabits.com. The new site design looks great. Thanks a lot. Also good to hear you like the new design. I appreciate the feedback. Started playing at 68 years of age, just 9 months ago. Electric blues/favourites are Freddie King & T-Bone Walker + SRV. My career has been outdoors and my hands are not very flexible, but that’s an excuse I won’t use to stop me progressing. Someone told me that I will need to play for approx 3000 hours to become a good guitarist. 10 hours a week = 500 hours a year. So, it will take me 6 years. Fair enough, I now play 10 hours a week. After 350 hours, I really feel I’m playing well. I learn theory, but mainly jam to my favourite songs on YouTube. Every time I play them over again, I incorporate some of the new theory I have picked up, and they get better. 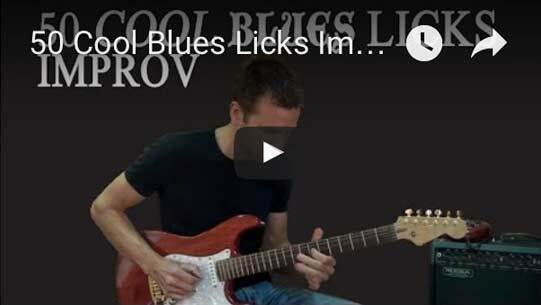 Guitar habits tips are great. You’re never too old to enjoy playing! Place the Guitar in a place where you will see it if it is out of sight most likely you won’t pick it up. Thank you for such clear explanations. I am just picking up my guitar again after many years of a “too busy” life. Now it’s time to learn from the young and enjoy my down time. Thanks again. I have to believe that playing with others is another good and fun way to practice, but it is not mentioned. Not having done so myself before I’d be interested in tips on finding others with common playing interests and levels to explore this part of learning. I used to keep a guitar next to the TV and practiced during commercials or bad programming. I would also play along with other artists that were on the air. Now that I have a dedicated space away from the TV, I do play longer but not as often. I’m going to put a guitar next to the TV again — for fun. These are all great ideas. I’ve been playing for 6 years now and I am 11. I’m not proud of where I’m at and want to practice more. Thank you all! Put that guitar next to the seat you`ll sit on.It will be looking right at you.